USEF Hunter Sire of 2017: Cabardino at home enjoying the snow. 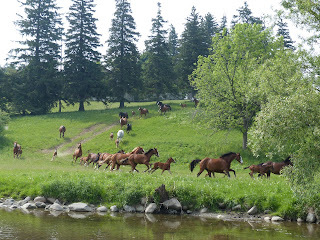 We'd like to offer special congratulations to Augustin and Christine Walch and W. Charlot Farms (Stratford, Ontario) on their impressive accomplishments recognized by USEF this year! Their stallion Cabardino (Carpaccio x Gaspari I) was named USEF Hunter Sire for 2017, and Augustin and W. Charlot Farms were USEF Hunter Breeder of the Year as well. It's special in part because it's not the first honor for the farm. W. Charlot Farms has been USEF Hunter Breeder of the Year twelve times since 2004! Congratulations! W. Charlot Farms has been USEF Hunter Breeder of the Year 12 out of the last 14 years due to the success their offspring have shown in the US. It was Rio Grande, the International Show Jumper and Hanoverian stallion, who first put the farm “on the map”. Rio Grande competed under Eric Lamaze and qualified to represent Canada at the 1996 Atlanta Olympics. 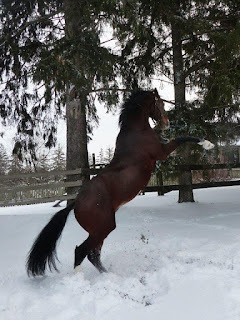 He became one of the most successful hunter and jumper sires in North America, making the top 10 of the USEF Hunter sires for close to a decade. Almost all broodmares at W. Charlot Farms carry the proven bloodlines of “Rio." Augustin started his breeding career in 1968 in his native Germany, and has been established as a preeminent breeder in Canada for almost four decades now. In addition to breeding very successful show hunter, W. Charlot Farms have bred international show jumpers and dressage horses. The legacy created by Rio Grande now continues thanks to Cabardino, who is the USEF #1 Hunter Sire for 2017. Cabardino is a Holsteiner Premium stallion by Carpaccio out of Gaspari mare. 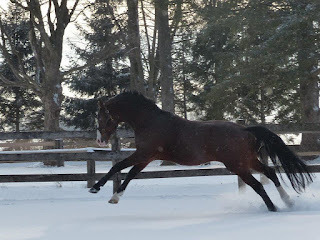 He is approved by the Hosteiner Verband, AHHA, Hanoverian Verband, AHS, Oldenburg, ISR, CWHBA, and CSHA. Cabardino was a spectacular 4' hunter and is now a sought-after sire. He was bred and started in Germany, where he has an approved son. In North America he initially competed successfully in Young Horse Jumper classes under Erynn Ballard before Erynn started showing him in the hunter ring. Cabardino was campaigned from 2006 to 2008, winning Working Hunter Championships at WEF, Kentucky National, Tournament of Champions and Combined Hunter, Adult/Amateur and Grand Champion Amateur Hunter Championships at the Royal Winter Fair in Toronto. He is the sire of the Sallie B. Wheeler/USEF National Hunter Breeding Champion “Sabrina” and has produced many hunter line class champions in addition to countless "A" circuit hunter champions at some of the most prestigious shows in North America. His daughter Socialite (out of a Rio Grande mare) received the Canadian Bred Hunter Award for the third time in a row at the 2017 Royal Agricultural Winter Fair. Cabardino is retired to stud and as playful as ever when turned out in his paddock. He is the star at the farm and loves all the attention and pampering that he gets. He stamps his offspring with his wonderful disposition and his spectacular jump. To view Cabardino's Stallion Profile, click here.